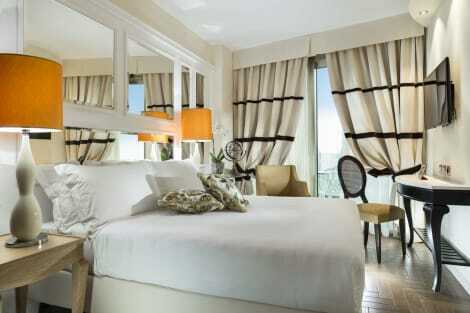 Make yourself at home in one of the 56 air-conditioned rooms featuring minibars and LCD televisions. Rooms have private balconies. Complimentary wireless Internet access keeps you connected, and digital programming is available for your entertainment. Private bathrooms with showers feature complimentary toiletries and bidets. With a stay at Diplomat Palace Hotel in Rimini (Marina Centro), you'll be within a 15-minute drive of Rimini Beach and Arch of Augustus. This 4-star hotel is 5.9 mi (9.5 km) from Rimini Fiera Expo Center and 9.7 mi (15.6 km) from Misano World Circuit Marco Simoncelli. With a stay at Erbavoglio Hotel, you'll be centrally located in Rimini, a 1-minute drive from Rimini Beach and 12 minutes from Rimini Fiera Expo Center. This 4-star hotel is 12.3 mi (19.8 km) from Misano World Circuit Marco Simoncelli and 1.3 mi (2.1 km) from Arch of Augustus. Relax on the private beach or enjoy other recreational amenities such as bicycles to rent. This hotel also features complimentary wireless Internet access and concierge services.